The Lib Dems are right to raise concerns about free schools as part of a pre-election move to set out their priorities, a Cabinet minister says. Ed Davey suggested the party had backed aspects of education policy as a price of being in coalition with the Tories. It comes after Deputy Prime Minister Nick Clegg said the schools should employ only qualified teachers and adhere to the national curriculum. But the Conservatives have rejected calls for tighter controls. No 10 said the government's policy on free schools was clear and "there is no change to it". In a speech later this week, Mr Clegg will distance his party from part of the government's policy on free schools in England but has denied his comments represented a "great coalition crisis". Free schools, set up by parents and other groups, are state-funded but operate outside local authority control. They were established under a policy pioneered by Education Secretary Michael Gove and since September 2011 more than 170 have opened across England. Currently free schools have discretion over what to teach, but Mr Clegg is set to question this and other features of the schools which he will claim have been driven by Conservative "priorities". While insisting he continues to back the schools and will not interfere with education policy, Mr Clegg will insist that "core standards" of teaching and care must be met. Last week, the head teacher of a free primary school in London, who was still studying for her postgraduate certificate in education, stood down following criticism from Labour councillors. There was also controversy when the al-Madinah free school in Derby was judged by the education watchdog Ofsted to be "inadequate" in a number of areas. Mr Davey told BBC Radio 4's Today programme that his party leader was "right to say that when taxpayers are putting money into schools, they should expect minimum standards from the teachers". "People will be surprised we are embarking on a programme that could mean that lots of unqualified teachers are teaching our children," he added. Downing Street has taken issue with the Lib Dem position, saying that, as recently as last week, the Lib Dem schools minister David Laws had said he was "100% behind" the policy. 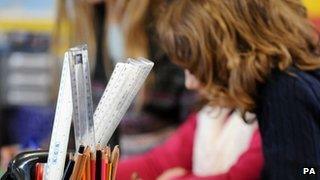 But Mr Davey said it was not "surprising" that the Lib Dems and the Tories disagreed over aspects of education policy. Asked why Lib Dem ministers - including schools minister David Laws - had not spoken out earlier, Mr Davey said neither of the parties could have "their whole way" in a coalition and ministers were bound by collective responsibility to defend the agreed "government line". Should free schools be forced to employ only teachers whose qualifications are approved by Whitehall, to teach only in line with the national curriculum and to feed children only if the food meets national guidelines. Yes, says Deputy Prime Minister Nick Clegg. No, says Tory Education Secretary Michael Gove. "A party leader preparing for the next election and our manifesto, talking about party policies that have gone through a democratic vote at the Lib Dem conference. He has got to put those policies forward and he is right to do so." In a vote at the party's 2010 conference, Lib Dem activists rejected free schools and urged parents to boycott them, claiming they would worse educational outcomes for the majority of children and complicate admissions procedures. At the time, Lib Dem ministers made clear that "government policy was made by government ministers". Transport minister Baroness Kramer said she believed the public understood that Mr Clegg had a "dual role" as deputy prime minister and Lib Dem leader, enabling him to talk about the party's future intentions as well as current policies. But Michael Gove's allies have accused Mr Clegg of "fundamentally misunderstanding" the nature of free schools. Graham Stuart, the Conservative chair of the Commons Education Committee, said the Lib Dems' position was "strangely illiberal" and left Lib Dem schools minister Mr Laws in a "difficult position". "My understanding is that a typical Liberal view would be believing that you trust the front line to decide how and who should teach but you hold them strongly to account through exam results and Ofsted," he told Today. "I thought they believed in localism and, yet, here we are at the first sign of trouble and Nick Clegg comes over all Barbara Castle. It's a very peculiar approach." And Conservative peer Baroness Buscombe accused Mr Clegg of being "two-faced" and "grandstanding" in order to appeal to his party activists unhappy with some of the compromises of coalition. "Nick Clegg is trying to keep his head above water and appear big and strong," she told the BBC's Daily Politics. Labour, who have also been accused of changing their position, have said they would not close existing free schools but would not allow new ones to open under the government's existing model. Although parent groups and other organisations would be able to set up schools outside local council control, local authorities would have greater powers to intervene when there were concerns about standards. Shadow leader of the House of Lords Baroness Royall told the BBC that her party had sought guarantees on teacher qualifications when legislation authorising free schools was passed but the Lib Dems had opposed this.